Under new legislation, school districts for the first time can spend a portion of state “book” money on computer hardware and digital content. Some fear the explosion of choice will produce an erosion of quality content. Under new legislation, school districts for the first time can spend a portion of state “book” money on computer hardware and digital content. And the state can stockpile and open-source electronic material, made available free to all schools. Some, including State Board of Education members, fear the explosion of choice will produce an erosion of quality content. In a historic shift, Texas public schools will soon start tapping the state’s multi-billion-dollar textbook fund for laptops and e-readers. A “book,” meanwhile, could become a living reservoir of content, freely edited and updated by educators and beamed to the classrooms, homes and handhelds of students statewide. Rather than replacing untold thousands of dead-tree editions every two years — for hundreds of millions of dollars — the state could own libraries of electronic content, some of which it might even get for free. Students could carry all that material on a laptop or an e-reader, amassing an on-demand virtual library over multiple years in school. and from the state to school districts. Gladwell’s best-selling book by that title reveals how seemingly small efforts by one or a few people can suddenly spark revolutionary change, spreading like an epidemic. Whether the digital revolution will run rampant through Texas schools remains an open question. The changes still don’t fully finance the ambitions of technology-oriented districts, particularly for hardware infrastructure. And much work remains to acclimate teachers, particularly in remote areas. But it’s clear that school systems will have far more freedom to tailor a whole new realm of content to the diverse needs of districts small and large, urban and rural — and that those who will lose stroke in the deal, most notably the State Board of Education, don’t like it. The new rules mark a stark departure from the state’s unique and comparatively one-size-fits-all textbook adoption process, one stretching back to 1918 when voters approved a constitutional amendment mandating the state provide free textbooks to all. “Our world has changed,” pronounced Anita Givens, the Texas Education Agency’s textbook and curriculum chief, speaking at a packed vendor meeting recently. Such meetings once drew only traditional publishers, but last week lured the likes of Apple and Dell; niche digital content publishers; and school district technology and curriculum chiefs eager to understand and exploit new opportunities. Many others joined via a first-time webcast. Most states allow local school districts to buy their own instructional materials, in print or otherwise. Twenty-two states have similar statewide adoption processes, Givens explained in an interview, but none has held the reigns of curriculum and money so tightly as Texas. Here, school districts never see the bill for textbooks, which some argue has limited downward free-market pressure on prices. The state traditionally provides only a limited menu of books to districts, then writes checks based on local choices. The opening of the textbook fund for technology purchases takes on more significance in the context of the state’s historically paltry financing of technology infrastructure. Districts have been lobbying for years to increase a state technology allotment of $30 per child, a pittance compared to state financing of books. Though imperfect and overdue, the new measures represent a bold step forward, said New Braunfels school superintendent Mike Smith. To access newly available choices, school districts will have to jump through a series of hoops laid out in the three separate but interlocking pieces of new law. As before, the state will set a maximum cost for each book. Say that’s $80 for a math book, making a district of 1,000 students eligible for $80,000 in materials. But new rules allow a district to purchase only a "classroom set" — which stays in the room, to be used by different students all day — from the list approved by the state school board, rather than a book for every child. Previously, district had no incentive not to buy every child a book — the state was paying, and the district would get none of the savings for buying less. Further, most publishers offered electronic versions of the material only as a package deal with the printed book. Say the district buys 200 books instead of 1,000. That leaves $64,000 in credit. The districts could then turn to a state new list of digital curriculum offerings — approved by the commissioner instead of the state board. The district might spend half the remainder on an interactive math program, delivered on a CD or over the Web — which state officials hope will eventually cost much less. What’s left, $32,000, would be considered savings on instructional materials, and would be split evenly between the district and the state. The district could then spend $16,000 on hardware, say, laptops for one math class or graphing calculators for everyone. The same scenario might play out in every subject area. Until now, all that money would have gone only to limited selection of books on the state board list. The changes result mainly from two legislative efforts. The higher profile of the two, HB 4294, authored by Rep. Dan Branch, R-Dallas, gives the commissioner of education the power to approve instructional materials and computer hardware, separate from the state board. Branch’s bill got a major boost when news broke in the Dallas Morning News, right at the beginning of the session, that the Irving Independent School District had warehoused $4.6 million dollars worth of textbooks. The boondoggle stemmed from combination of state rules and inflexible offerings from publishers — who often have bundled their electronic version with print copies — forcing the district to purchase books it didn’t want or need. The new mandate that districts buy at least a class set of state-board-approved books was a compromise for those who feared losing standardization and state board control. For some superintendents who have evangelized for digital materials, even that provision should be tossed. Before coming to New Braunfels, Smith was the superintendent in Forney ISD, where he purchased both print and electronic versions of books. Another bill may have less immediate effect but could prove profound in the long term. HB 2488, authored by Scott Hochberg, D-Houston, allows the state to offer so-called open-source materials to districts statewide. Hochberg set out to pierce a hole in existing statutes that “envisioned only a one-student-to-one-thing model.” Rather, the state would own content, and could allow educators, professors and vendors to perpetually update and augment the materials, creating an infinite number of custom derivatives. Initially, he aimed only to tap college professors willing to write instructional content for free, to fulfill their publish-or-perish career requirements. But in the waning hours of the session — with textbook lobbyists’ attention drawn toward the Branch bill and a threatened textbook appropriation — Hochberg added a provision allowing the TEA to purchase open-source digital content as well, without permission of the state school board. The quiet coup could help open the book market, dominated by few giant players, to an entirely new and unpredictable set of providers, from work-a-day teachers and professors to software giants. In the meantime, the bill gives Texas universities a wide-open door to the schools market: They can approve the work of their own professors, provided they sign off on its accuracy and alignment with state curriculum standards. The law mandates that the State Board of Education “shall” put the university submissions on the state-approved list — it has no power to reject. For a century or more, the State Board of Education has controlled curriculum and textbooks, a task it has often approached with relish and no small amount of controversy. That’s both because of the gravity of the task — determining what 4.6 million public school students will learn — and because, at least today, the board controls little else. The Legislature has steadily eroded the board’s power over the years. In 1995, it stripped the board of the power to nominate and oversee the state commissioner of education. Now appointed by the governor without board input, the commissioner, currently Robert Scott, operates with almost complete independence in running the TEA. The new legislation diminishes the board’s role even further — pushing new actors onto its prime platform for politicking and policy-making. Board members are predictably irked. The textbook fund should be spent on content – not computer hardware, said Board Chairwoman Gail Lowe. The board also unanimously objects to the alternate pipelines for delivering content to classrooms. The right to free textbooks would become synonymous with free public education, ultimately enshrined in the 1918 constitutional amendment requiring the state to buy books for every child. Today’s statewide adoption process has its roots in that history. Defenders of the status quo, and even many detractors, say its beauty lies in that guarantee of state-purchased books vetted through a rigorous process. It’s one shining example of equity in a diverse state with deeply divided economic classes. David Anderson knows more about the history of Texas textbooks, from ancient to recent, than most anybody. Now a Hillco lobbyist who counts Houghton-Mifflin Harcourt among his clients, he previously sold textbooks for 18 years and served as a curriculum chief for the Texas Education Agency from 1997 to 2003. When he started in the business, the old timers used to tell him stories of the pre-1950s state board, then appointed by the governor, retreating to private smoke-filled rooms of the Stephen F. Austin hotel to dole out exclusive contracts — one company would own a specific subject for the whole state. “Back then textbook companies didn’t need marketing people; all they needed was the board members,” Anderson said. In the mid-90s, the advent of the accountability and standardized testing movement, along with the state board’s enthusiastic customizing of curriculum, would combine to drive up textbook prices to levels that today outrage legislators who hold the purse strings, Anderson said. With its power over other matters curtailed, the board dived deeply into writing content standards for the state and making sure they matched newly important state tests — and often their own political bents on history, literature and social issues. 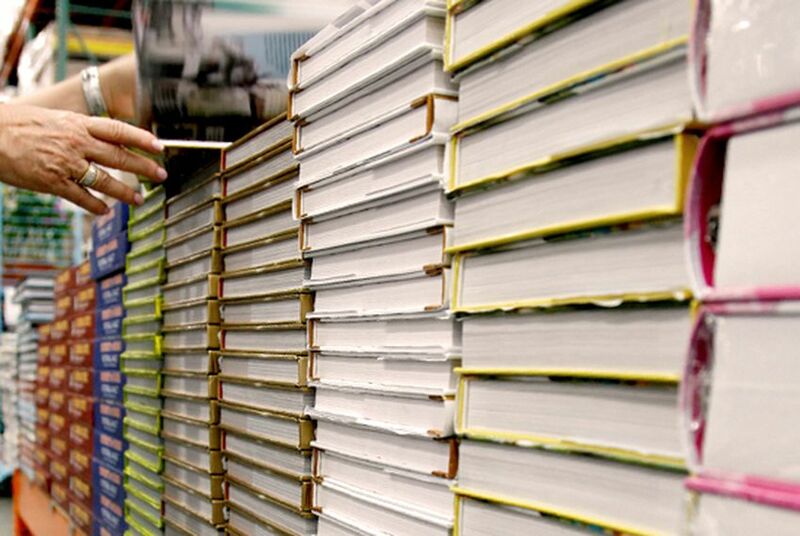 And so Texas textbooks became increasingly a custom job: Book publishers made them literally to order. This last session, the legislature choked on the state request for more than $900 million for textbooks, and cut the allocation for the portion of the request earmarked for new materials, nearly $600 million, by 15 percent. The allocation for the upcoming two-year cycle starting in 2011 is about 1.5 billion, split roughly evenly between English and science materials. The push for digital content came in part because of legislators’ belief that publishers should deliver such materials for much cheaper – a contention that remains in dispute. Textbook makers have asserted that the vast majority of their cost goes into development, not printing. Hochberg believes he discovered the smoking gun that disproves that claim. He was the one grilling Pearson publishing executive Dowling during a hearing of the education subcommittee on appropriations earlier this year. Deep in the testimony, he pressed, in the manner of a prosecutor, on the question of why publishers charged Texas schools the same price for a digital version of their textbooks when it obviously saved bundles on printing, storage and delivery costs. A clearly uncomfortable Dowling acknowledged the cost savings — and then confirmed that the company gives price breaks on electronic versions in the majority of states where districts, not the state, controlled the purchases, “open territory” in industry parlance. One stunned member asked: “Is the e-book package cheaper” in other states? “Yes … I believe it is,” replied Dowling — who had minutes before contended that almost all the publisher’s costs were wrapped up in content creation, not printing and delivery. “Then why isn’t it here?” an incredulous Hochberg asked. “Well, because they’re created for Texas to meet your specific requirements,” Dowling said. Some texts are particularly ripe for digital conversion. After the Dowling testimony, Hochberg set out to examine the economics of literature anthologies, which seemed like low-hanging fruit, given much of classic literature has entered the public domain — free to use and copy. An upcoming state purchase of hard copies, he said, had been estimated at $220 million. He asked one company to give him an estimate on digitally delivered files. It came back at $14 million, he said. That view vastly oversimplifies the complex economics of Texas textbooks, Anderson maintains. Because the state essentially custom orders most textbooks, which can’t always be sold nationally, companies must develop Texas-specific materials up to three years in advance of finding out whether they’ll sell a single copy — which can mean flushing millions in development costs. “They can sink 85 or 90 percent of the cost into something just to submit a bid, and then the legislature can say, ‘oh, we’re not going to buy all those books,’” he said. Frey has taken over the mantle of textbook watchdog — some might say censor — from the late Mel and Norma Gabler, Christian conservatives who for decades exerted broad influence over what Texas children were taught, scrutinizing each new version for errors, in their view, of both fact and philosophy. In Frey’s view, the creation of a parallel adoption process for content — under the unelected commissioner of education — makes no sense, adds cost and complexity and messes with the time-tested Texas status quo. All-important questions of what Texas students learn should be centrally and democratically controlled, he said, not divvied up between a state bureaucracy and a thousand different school districts. “Superintendents want the curriculum controversies settled in Austin, rather than having districts fight through all the battles one by one. Like evolution, for example, does the book conform to state standards on scientific theories?” he asked. “It’s an issue of popular sovereignty. The elected officials need to have input. The state board is the only place citizens can talk back to what really is an oligopoly,” he said, referring to the textbook industry. Oligopoly refers to a market controlled by few peddlers, and the term fits. The bulk of the textbook industry has consolidated mainly into three giant players: Houghton-Mifflin Harcourt, Pearson, and McGraw Hill. What most people don’t understand is that publishing companies neither write nor print books: They instead act largely as middlemen, contracting with writers and printers and marketing (or lobbying) their wares to customers — with Texas being a crown jewel among clients, because of its tightly controlled statewide adoption. Givens, the TEA administrator, believes the creation of a commissioner-approved list of electronic content will pry open the door of the oligopy for all sorts of bit players to enter the market, for subcontractors to become direct contractors. Hochberg envisions nothing less than a revolution. He draws a parallel with the explosion of the Apple iPhone ­— and the more than 80,000 applications now available for it, some free, some paid, from thousands of suppliers. If the state could purchase and own the rights to libraries of educational content, it could solicit and endless number of additions and improvements from a limitless number of teachers, professors, technology companies and, of course, traditional textbook publishers.